WASHINGTON (AP) — In the shadow of the Capitol and the election, comedians Jon Stewart and Stephen Colbert entertained a huge throng Saturday at a “sanity” rally poking fun at the nation’s ill-tempered politics, its fear-mongers and doomsayers. Screens showed a variety of pundits and politicians from the left and right, engaged in divisive rhetoric. Prominently shown: Glenn Beck, whose conservative Restoring Honor rally in Washington in August was part of the motivation for the Stewart and Colbert event, called the Rally to Restore Sanity and/or Fear. It appeared to rival Beck’s rally in attendance. The idea was to provide a counterweight to all the shouting and flying insults of these polarized times. But there were political undertones, too, pushing back against conservatives ahead of Tuesday’s election. Shannon Escobar, 31, of Bangor, Pa., came with a group of 400 people on buses chartered in New York. A supporter of President Barack Obama in 2008, she said she’s tired of nasty rhetoric from both sides and disenchanted with lack of progress in Washington. “I need him to stay pure,” she said, deadpan. Stewart is popular with Democrats and independents, a Pew Research Center poll found. Colbert of “The Colbert Report” poses as an ultraconservative, and the stage was stacked with entertainers associated with Democratic causes or Obama’s 2008 campaign. Even so, Stewart said the day was about toning down anger and partisan division. “Shouting is annoying, counterproductive and terrible for your throat,” he said on his website. 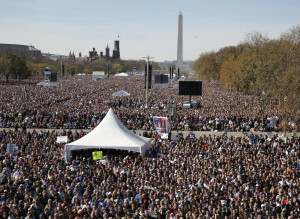 Comedy Central’s park permit anticipated a crowd estimated in advance at 60,000.